Stellar is required by law (Real Property Law 235-e) to issue receipts for rent that you pay by money order or cash. If you pay by check and still want to get a receipt, you must ask for it in writing each time. • Major Capital Improvement No MCI increase if there is a pending hazardous violation in the building. No MCI rent increase for electrical submetering. Our lawyer has informed DHCR about this since we have a pending case opposing Stellar’s MCI for submetering. • “non-primary residence” court action against tenants who in fact live in their apartments at least 183 days per year. • Electrical submetering overcharge – were you one of the 142 tenants now getting credit? • Late fees – they are illegal for rent stabilized tenants in this building. • Whether Stellar threatened to or actually did take you to court for rent you had already paid, or for not living here when you do. Your survey will remain anonymous. We’ll add the information you provide to a summary without names, and only the summary will be shared with other tenant groups, and possibly the state. Many of us know Barbara for the wonderful roasts she and her husband Frank Leonardo bring to the Pot Luck every year. But in addition to cooking and being a community gardener, Barbara is an author and playwright. See her Wikipedia page! 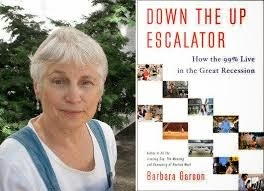 In talking about her latest book, Down the Up Escalator: How the 99% Live, Barbara spoke about the people who are doing everything they’re supposed to – “investing in themselves” with student loans, buying homes, raising a child, with both parents working full time – but unable to make ends meet. Since U.S. wages have only gone up some 4% since the 1970’s, while productivity has gone up nearly 100%, more things are being produced than people can afford to buy. Instead of paying people more so they can afford to buy what American companies are selling, companies now lend the money through credit cards. That means people have to pay money for the products they buy and often pay interest on the credit cards. Barbara pointed out the big gap between people like most of us in this building, and the investors who become wealthy through buying and selling things that no longer represent anything concrete. Instead of a bank holding a mortgage with a house as collateral, banks bundle tens of thousands of mortgages together and sell shares of that bundle. (Since the bundles are “derived” from the original mortgages, the bundles and the shares of them that are sold are called “derivatives.”) Since the original lender sells the mortgage for bundling with others, the lender doesn’t care whether specific mortgages were affordable to the people who took them or not. And so we have “bubbles” – people paying a lot to buy shares of packages of . . . things no longer connected to homes or corporations. In real estate, investors buy buildings on the assumption that they will be worth more and more – but if that turns out not to be the case, the owner may walk away (as Gluck did for the RivertonApartments), leaving the bank to foreclose – and run the building. The book, like Barbara, is funny, smart, and fascinating. Wed., March 12 General Tenants Meeting: Tenant Patricia Jordan – retiring from decades of working with the city’s Department of Housing Preservation and Development (HPD), will speak. 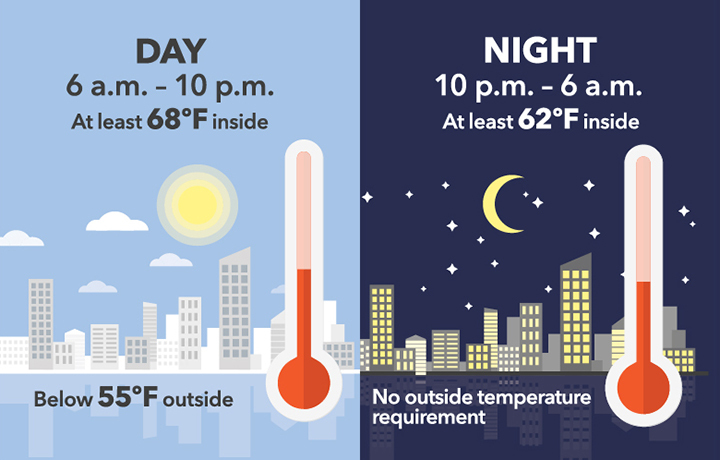 HPD does both development an enforcement: It is the agency that is supposed to respond to many tenant complaints about lack of heat, hot water, and other legal requirements. Many of you contributed clothing for the post-Hurricane Sandy shelters for the disabled and others that Pat set up and supervised. Wed., May 14 General Tenants Meeting: Come hear a Fire Department representative.